Well, sort of. We were in a Benz, but it wasn't our fault, and nobody was hurt. We didn't run into an antique store afterwards but we probably would have, had we been all drunk from lunch at The Ivy. 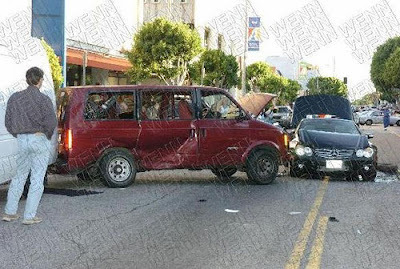 That little faux pas is going to cost Lohan big bucks as she hit a guy and of course he's suing. His employer is not only suing Lindsay, but he's suing The Ivy for $200 grand because they served alcohol to her. At the time, she was only 19 years old. This comes right on the heels of a nightclub being investigated for serving Lohan the night she got a DUI. Through it all, she's still so psyched that she'll be of age to drink that she's throwing a huge 21st Birthday Party in Vegas to celebrate. Rock on.